*** DECEPTIVELY SPACIOUS *** OPEN REAR ASPECT *** INDIVIDUAL DESIGN *** TASTEFULLY MODERNISED *** ATTRACTIVE ACCESSIBLE VILLAGE *** HANDY FOR RICHMOND, BARNARD CASTLE AND DARLINGTON *** Entrance Hall, Lounge, Kitchen/Dining Room, Study, 4 Good Sized Bedrooms, 2 En-Suite Bathrooms, Family Bathroom/WC, Garage, Driveway, Private Side and Rear Gardens, Oil Fired Central Heating, UPVC Double Glazing, Security Alarm. ENTRANCE HALL Ceramic tiled floor, engineered oak laminate floor, radiator, access to loft space, built-in cloak cupboard. Double glazed entrance door to side. Double glazed window to side. 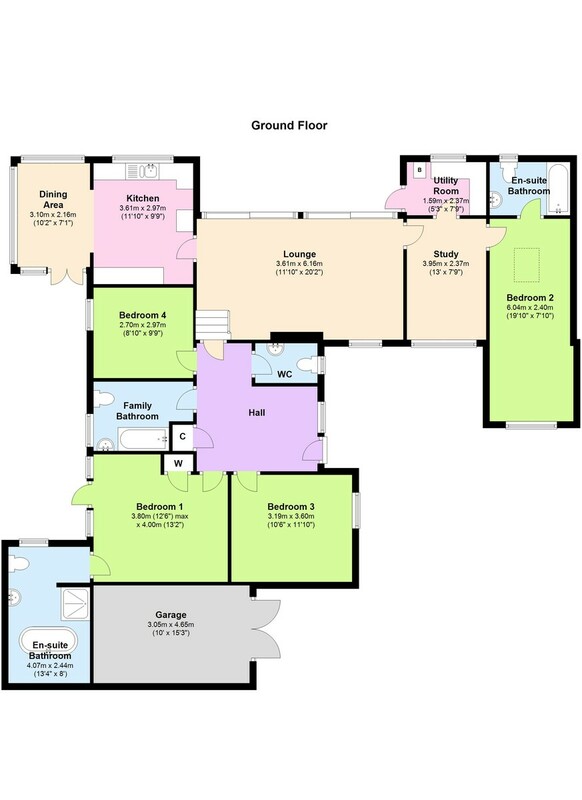 Doors to Lounge, Cloakroom/WC, Bedroom 1, Bedroom 3, Bedroom 4 and Family Bathroom/WC. BEDROOM 3 10' 6" x 11' 10" (3.2m x 3.61m) Radiator. Double glazed window to side. Door to Hall. BEDROOM 1 12' 6" x 13' 2" (3.81m x 4.01m) (maximum depth). Built-in wardrobe, radiator. Double glazed entrance door to Side Garden. Double glazed windows to side. Doors to En-Suite Bathroom and Entrance Hall. EN-SUITE BATHROOM/WC 13' 4" x 8' (4.06m x 2.44m) Pedestal wash hand basin with mosaic tiled splashback, feature free-standing bath, large shower cubicle with mosaic tiles, extractor fan, low level WC, slate floor, radiator, ceiling halogens. Double glazed window to rear with roller blind. Door to Bedroom 1. BEDROOM 4 8' 10" x 9' 9" (2.69m x 2.97m) Radiator. Double glazed window to side. Door to Hall. FAMILY BATHROOM/WC Pedestal wash hand basin with tiled splashback, panelled bath with shower over and screen, extractor fan, low level WC, ceiling halogens, wall mirrored door cabinet, radiator, oak effect laminate floor. Double glazed window to side. Door to Entrance Hall. CLOAKROOM/WC Pedestal wash hand basin with tiled splashback, low level WC. Double glazed window to side with roller blind. Door to Entrance Hall. LOUNGE 11' 10" x 20' 2" (3.61m x 6.15m) Oak boarded floor, open fireplace with sandstone surrounds, wall spotlights, television point, telephone point, two radiators. Double glazed sliding doors to rear. Double glazed window to front. Part glazed doors to Entrance Hall, Kitchen and Study. KITCHEN 11' 10" x 9' 9" (3.61m x 2.97m) Stainless steel one and a half bowl sink unit with mixer tap, oak work surfaces, cream cupboards and drawers with chrome handles, electric cooker point, stainless steel splashback and extractor hood, fridge space, freezer space, ceiling halogens, oak effect laminate floor, radiator. Double glazed window to rear with roller blind. Part glazed door to Lounge. Archway to Dining Area. DINING AREA 10' 2" x 7' 1" (3.1m x 2.16m) Slate floor, ceiling halogens, underfloor heating. Double glazed windows to front, side and rear with roller blind. Double glazed double doors to Side Garden. Archway to Kitchen. STUDY 13' x 7' 9" (3.96m x 2.36m) Engineered oak laminate floor, radiator. Double glazed window to front. Part glazed doors to Lounge and Utility Room. Door to Bedroom 2. UTILITY ROOM 5' 3" x 7' 9" (1.6m x 2.36m) Laminate work surface, plumbing for washing machine, tumble dryer space, oil fired combi boiler, cream cupboards, extractor fan. Double glazed window to rear. Double glazed door to Rear Garden. Part glazed door to Study. BEDROOM 2 19' 10" x 7' 10" (6.05m x 2.39m) Radiator. Double glazed window to front. Double glazed velux window. Doors to Study and En-Suite Bathroom/WC. EN-SUITE BATHROOM/WC Pedestal wash hand basin with mosaic tiled splashback, panelled bath with mosaic tiled surrounds and shower over with glass screen, low level WC, ceramic tiled floor, electric shaver point, ceiling halogens, radiator. Double glazed window to rear. Door to Bedroom 2. FRONT Concrete driveway providing ample parking. Security lighting, lawn. Gate and path leading to Side Garden. GARAGE 10' x 15' 3" (3.05m x 4.65m) Light and power sockets. Double timber doors to front. PRIVATE SIDE AND SOUTH FACING REAR GARDENS Lawn, vegetable bed, oil tank, cold water tap, security lighting.